It's been a good seven months since my last blog entry about the awesomeness that is One Piece, but ya'll knew I was going to come back to it, right? I took about seven months off from my binge to watch other anime, but I was also waiting for the rest of the episodes to be uploaded on either the Funimation or Crunchyroll channels. Oddly enough I started this series on Funimation, but watched all of this particular season on Crunchyroll since they finally have 99% of the series ready for streaming. I really do wish I could have gotten this season finished before Halloween since the Thriller Bark arc deals with haunted ships, ghosts, zombies, and even a take on Dr. Frankenstein. At a length of 45 episodes, the Thriller Bark arc almost seems short compared to the Water Seven/Enies Lobby arcs. That's where I left off in my reviews, if you remember correctly. That review was a long one even though I still cut it short. My review came out to something like 2,500 words, I think. That's not my longest post, but between my entries about One Piece and my entries about Naruto, I'm fairly certain I come across as being long-winded. I guess I won't deny that, either. I just like talking about what I like doing. We last left off on the Post-Enies Lobby arc. I can't even remember if that's the proper term for it because it has been so long, but I'm 380+ episodes into this series and all of that Enies Lobby stuff was about eighty episodes and seven months ago. So I am kind of fuzzy on many of the finer details, but I suppose I should go into some of the Post-Enies arc a bit more before I begin with my ramblings about Thriller Bark. The Straw Hats have settled the score by defeating Rob Lucci and the entire island of Enies Lobby. However, the confrontation led to the Straw Hats being wanted world wide and for their bounties to increase significantly. They drew so much attention to themselves that even Monkey D. Luffy's granddad Monkey D. Garp came to visit him. However, it should be noted that Monkey D. Garp is a Marine Vice Admiral. Even Shanks and Luffy's mysterious father Monkey D. Dragon are aware of the Straw Hats and their newfound fame. One of the perks of launching an assault against the World Government, I suppose. 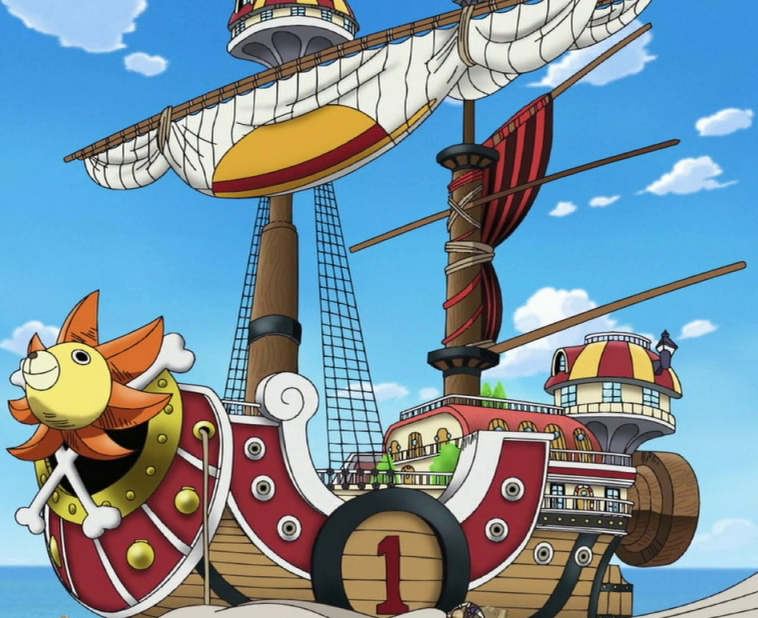 Now that they've survived that brutal encounter on Enies Lobby, the Straw Hats must push deeper into the Grand Line with their new ship the Thousand Sunny and their new crewmember Franky. So the Straw Hats going into the Thriller Bark arc are Monkey D. Luffy, Usopp, Nami, Roronoa Zoro, Sanji, Tony Tony Chopper, Robin, and Franky. Just after the Straw Hats topple Enies Lobby a serious confrontation takes place between Luffy's brother Portgas D. Ace and rival pirate Marshall D. Teach. This confrontation seems to have little to do with the events of Thriller Bark. In fact, Thriller Bark seems to have very little to do with any of the previous events. On the surface it seems like a filler arc because it just seems so out of place and different. It starts off a bit silly and takes a little while to build up (which could be said of a few arcs in this anime), but it is certainly worth the wait for the action. 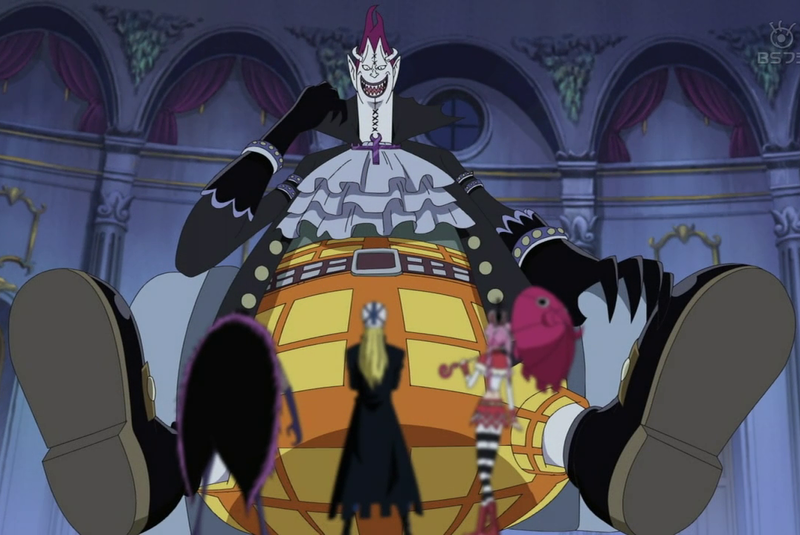 The outcome of the battle between Teach (also known by his nickname Blackbeard) and Ace will have a ripple effect throughout the pirate world, but the Thriller Bark arc makes almost no mention of the outcome of the battle until the very end. Perhaps one of the most important things about Thriller Bark is that it introduces the characters of Brook, Gecko Moria, and Bartholomew Kuma. 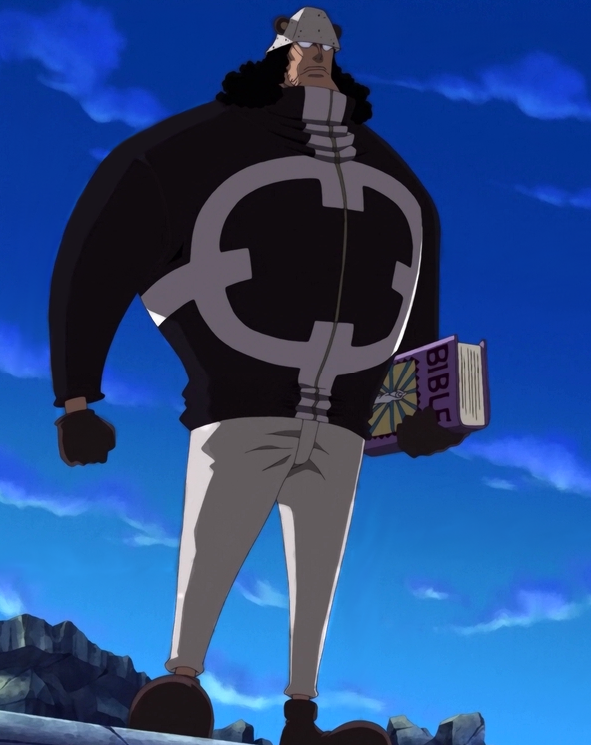 BROOK - Meet the newest member of the Straw Hats. 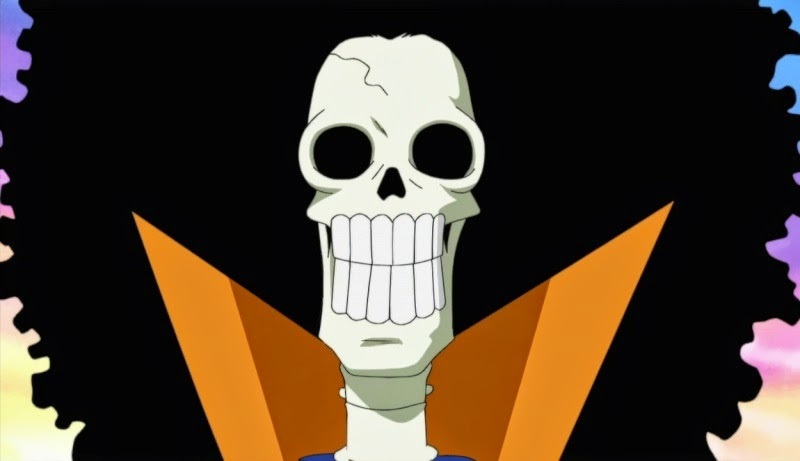 Brook is not only a dead guy, but he's a skeleton, too. He's been dead for close to fifty years, but he still manages to keep a good humor by making some rather cheeky jokes. Not that he has cheeks because he is a skeleton. Armed with a sword and a rather impressive afro, Brook joins the Straw Hats briefly when the Thousand Sunny stumbles across the ghost ship that has been Brook's home for the last half-century. Brook's crew has long since been killed off by disease and bloodshed, but what keeps Brook going is that he ate the Revive-Revive fruit long ago when he was still living. After having been killed with most of his crewmates in the aftermath of a battle, Brook revived immediately but his spirit could not find his own body in the foggy water sof the Florian Triangle. By the time he did manage to find his body floating on his rudderless ship a few years had past and his body had been reduced to nothing but bones. Although his treasured afro still remained. Although why he is a walking bag of bones does not explain why he has no shadow. That is where Gecko Moria and Thriller Bark enters the picture. GECKO MORIA - Aboard the island-size ship Thriller Bark that haunts the mysterious region known as the Florian Triangle is the demonic member of the Seven Warlords of the Sea, Gecko Moria. Gecko has only one true devilish ability, but with his minions serving him he proves to be one truly dangerous foe to be (ship w)reckoned with. Gecko Moria can manipulate any and all shadows under his control. He can also sever a person's shadow by grabbing onto it. Once the shadow is severed it is placed into one of the zombies created by Dr. Hogback and the zombie will be granted with the abilities of the shadow's former possessor. The zombie will also be strictly loyal to Gecko Moria. Brook fell victim to Gecko Moria's ability on an ill-fated trip to Thriller Bark years ago, but now that the Straw Hats are there with him he believes he can reclaim his shadow from the samurai zombie Kyuma. Unfortunately, Luffy, Sanji, and even Zoro all lose their shadows to Gecko Moria, too. Now what losing a shadow means in the short run is that you lose consciousness and then get left out to sea on your ship. You aren't killed because your life span is attached to your shadow's life span. However, not having a shadow means your body will not be able to absorb any sunlight at all. That means that exposure to sunlight will burn up your body the instant it touches you since it can't pass through you. Your life would essentially be deprived of sunlight forever and in all likelihood your remaining days would be spent in the Florian Triangle where it is almost eternally foggy. So it is quite imperative for the Straw Hats to defeat Gecko Moria in order to reclaim their dream of sailing to the New World and discovering the treasure known around the world as One Piece. Gecko Moria is initially a very annoying character with an annoying laugh. It's tough to take him seriously and he is easily dislikeable since he comes across as one of the more coward-like villains since Foxy the Silver Fox. Although he is quite a formidable adversary for Luffy since his attacks aren't really about strength, but about deception and strategy. It's only when he is pushed into a corner that he relies on strength and that ultimately is his real weakness. Strength, for the most part, doesn't work on Luffy because he is made of rubber. Unless it is strength of ungodly proportions, but we'll get to that later. It's only thanks to Dr. Hogback creating a truly tremendous beast to host Luffy's shadow that this arc really lives up to its promising premise. The beast, while certainly stupid like Luffy to start with, gradually becomes a menacing beast and once he starts being piloted by Moria himself the fight becomes just the badassness I've been expecting from One Piece. Of course, victims of Gecko Moria's abuse comes to Luffy's aid and transplant one hundred shadows into his body to help even up the fight. Nightmare Luffy's fight with Zombie Luffy is pretty badass. In some ways it dwarfs the final confrontation with Gecko Moria. While none of the fights are as epic as the fights on Enies Lobby, I think it is tough to call the fight between Nightmare Luffy and Zombie Luffy a bad fight. In fact, it wasn't until the Thriller Bark that I decided that this could very well be one of my top anime of all time. I think the fights are better than Dragonball Z and the characters are more likeable than in Naruto. The filler doesn't drag on forever, either. While the filler may be a bit boring it doesn't last for twenty or forty episodes at a time like Naruto or Bleach. I was curious as to how this anime would hold up for me after I took a seven month break from it, but it fit just like a glove when I got back to it. Although I don't think Thriller Bark is one of the more stellar arcs from One Piece it still packs a punch and Bartholomew Kuma's sudden appearance on Thriller Bark makes things even more interesting. BARTHOLOMEW KUMA - He is one of the Seven Warlords of the Sea. Up until this point there have never been two Warlords to battle the Straw Hats side by side. That remains the case here, but this is the first time that one of the Warlords battles the Straw Hats immediately after the other was defeated. With Luffy unconscious after defeating Gecko Moria and with the rest of the Straw Hats too weak to move, Zoro and Sanji must face down Bartholomew Kuma by themselves. Of course, Zoro knocks Sanji out and takes on Kuma alone and with disastrous results. Kuma is a far more dangerous guy than Gecko. Or course, this could be attributed to the fact that Kuma isn't underhanded and doesn't rely on tricks. 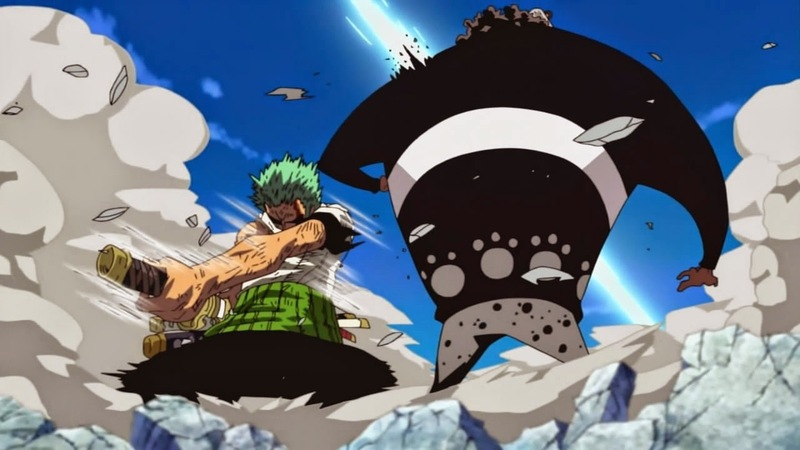 Kuma uses brute strength and is physically enhanced in ways that not even Franky can compete. 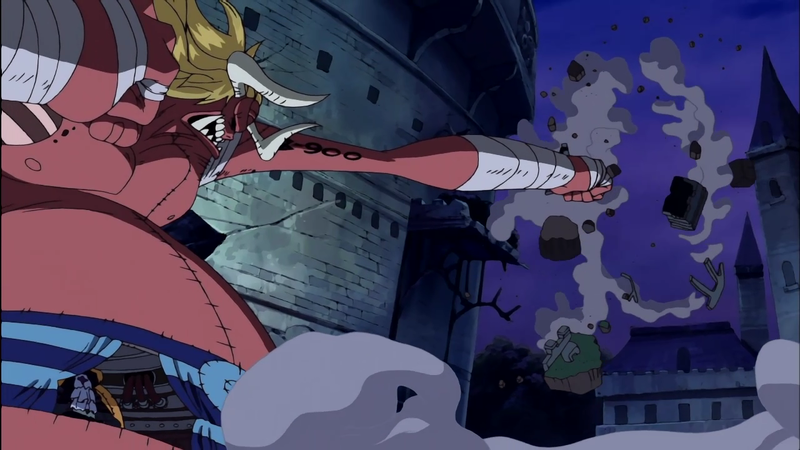 Kuma uses an attack called Ursus Shock that leaves all of Thriller Bark completely leveled, but that's not the worst of it. Kuma takes all of Luffy's battle damage from his fight with Moria and Zombie Luffy and transfers it into Zoro. It's only because of Bartholomew Kuma's strange sense of honor that that closely resembles Zoro's that the Straw Hats aren't completely wiped out. Believing that Zoro is dead from his injuries and that it will only be a matter of time before the Straw Hats will be wiped out anyway, Kuma relents on his assault and leaves Thriller Bark. While the Straw Hats have always made a way of beating their foes, Thriller Bark shows that maybe the Straw Hats aren't really ready for their assault against the World Government or for the New World. Sure, they toppled Enies Lobby and survived a Buster Call, but there were none of the Seven Warlords present on Enies Lobby. In the aftermath of Thriller Bark, Brook joins the Straw Hats as a full-time member and we get a glimpse of Brook's days as a living human with flesh. If anyone can remember when the Straw Hats first crossed into the Grand Line about 300 episodes ago, you should be able to remember Laboon. Well, Brook was one of the pirates on the ship that traveled with Laboon before leaving him at the entrance of the Grand Line. It's a pretty touching story as all of the background stories in One Piece are, but it's one that might mean a bit more since it brings a bit of closure to something I knew I had kind of forgotten. When Brook mentioned Laboon I was like, "Oh, yeah, I remember that." I think that part in particular is a sign that this story isn't just action, but there is an actual story going on here, too. Even minor characters like Laboon have a significance in this story. They aren't just there for the sake of adding more characters to make the narrative longer. I am having a blast watching One Piece. Still. After 380+ episodes. Look for it to be number one on my list of the best anime I've seen in 2014. No, I didn't catch up to the simulcast in six months like I had wanted to do, but I don't care anymore. I'll get there eventually.